Bahrain and United Arab Emirates will represent Gulf Basketball Association sub-zone in the upcoming FIBA U18 Asian Championship in Bangkok, Thailand. 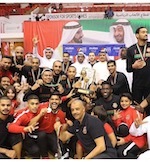 Bahrain swept the Qualifying to win the Championships while United Arab Emirates finished second with an impressive 3-1 record. The FIBA U18 Asian Championship 2018 will take place in Bangkok, Thailand from 5-11 August 2018.